The first decade of the 20th century saw the beginnings of the serious practical uses of wireless telegraphy. Early success came in areas where the value of speedy communication was already appreciated, such as in the military and especially at sea. The advantages of wireless for maritime use were obvious and had been appreciated by Marconi from a very early stage. His ambitions in this direction are evident from the formation of a subsidiary company, the Marconi International Marine Communication Company, in 1900. 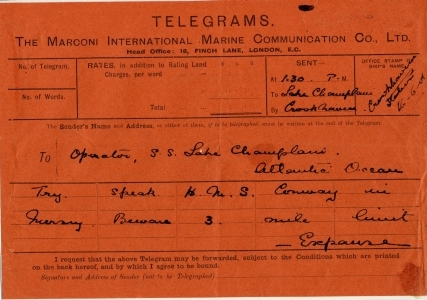 The earliest surviving ‘Marconigram’ - a telegraph message sent using an official form produced by one of Marconi’s companies, to the operator on the Lake Champlain, June 1901. 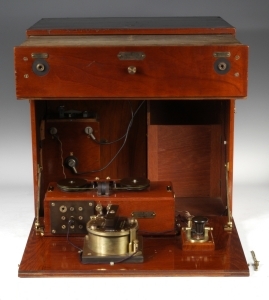 Portable Lifeboat Transmitter Receiver, by Marconi’s Wireless Telegraph Co. Ltd, Early 20th Century. This is a unique early example of a fully self-contained portable transmitter and receiver. The robust design was intended for use on lifeboats. Tuned Field Transmitter, by Marconi’s Wireless Telegraph Co. Ltd , 1907. 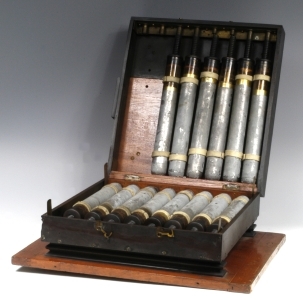 This was one of the first portable wireless transmitters for use by the Army. It was tuned by a bank of Leyden-jar capacitors.